Everyone loves Chanukah. Truth is, though, there’s no Jewish holiday that’s as dangerous. Think about it. Open flames? Check! Boiling oil? Check! Sharp graters for latke-making? Check! Try these helpful tips to help you minimize the risks and have a safe and bright Festival of Lights. Don’t leave your menorahs unattended – Never leave a room where a menorah is lit. Either wait for the candles to go out, or put them out yourself if you need to leave the room or house. 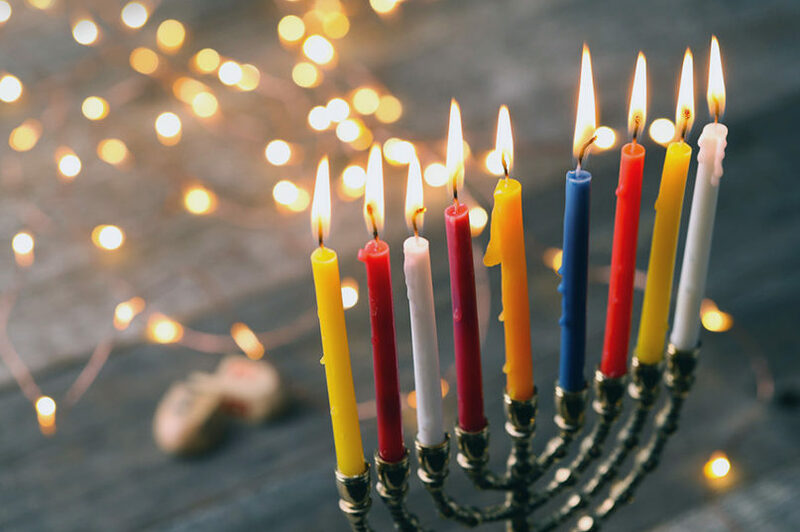 Use a non-flammable surface – If you’re putting your menorah on a wooden surface, be sure to lay down aluminum foil or another non-flammable material. Better yet, place your menorah on a stone or marble counter, or glass or metal surface. Find someplace sturdy – Weebles may wobble and not fall done, but not so menorahs. If your dining room table is a bit wobbly? Don’t put your menorah there! Any piece of furniture with wheels is also a bad idea. Opt for a sturdy, safe surface. Keep pets away – This might be easier said than done, especially with adventurous cats around, but it’s better to not put that menorah anywhere your pets are known to get to. Ditto, little tykes – Make sure your menorahs are away from edges and are high enough to deep little hands from grabbing a lit menorah. Keep paper and fabric away – Put up any decorations far from where you’ll be lighting your menorah. If you’re putting your menorah by the window, make sure there’s no way for the flame to touch those curtains. Keep any papers out of the area where the menorah is lit. And when you’re lighting those candles, make sure they’re far from your clothing and hair! Don’t light your kid’s art and crafts menorah – Your kids’ hand-made menorahs are super cute –but they can also be fire hazards. Make sure they’re non-flammable before you light candles in them. Check your fire and carbon monoxide detectors – For peace of mind, a week before the festivities, make sure your fire and carbon monoxide detectors are operational. Never fill your pan with too much oil, and keep it from getting too hot – It’s a good idea to use an oil with a high burning point, like canola oil or olive oil. Keep your pan and pot handles facing the inside of the stove – It’s a good way to keep them from getting knocked over. You DO NOT want that boiling pan falling on the floor. Keep flammable materials away – Keep your hair and shirtsleeves pulled up and away from the flame. Ditto paper towels. Don’t extinguish a fire with water – In case of a grease fire, turn off the stove and use a pot lid or a baking pan extinguish a grease fire. If that doesn’t work, you can douse it with lots of baking soda. Keep a good burn cream handy – Let’s be real: accidents happen. If you do get burned, run your burn under cold water right away. Dispose of your oil properly – Don’t throw that oil down the drain! It will clog your pipes. Instead, let it cool and put it in a closed container that you can throw away.